An educator asks the press to do its homework and not just parrot leaders who claim great gains in educational achievement. If reporters did that, they would have found that a 60-percent increase in math performance in a Miami school, praised to the skies by President Obama, might not signify very much. 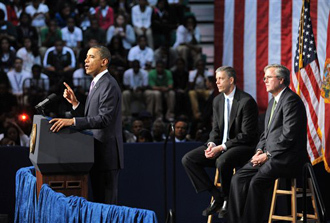 President Obama was at Miami Central High School recently to promote his school reform agenda. In news accounts reported across the country he pointed to academic improvements at Miami Central in support of a trinity of "reform" claims. First, that it is schools that make the difference in student achievement; second, that teachers and principals make the biggest difference in whether or not students in a particular school succeed (although lip service is paid to students and parents as being partners); and finally, that current testing and accountability programs can show us which schools need to be "reconstituted." Out with the old, in with the new. What follows is what I wish the media would do instead of simply reporting the "facts" used in these campaigns. Our fourth estate should not just parrot promoters of particular policies, but should instead seek to provide a deeper context for the overall message being promoted. Miami Central was used to illustrate that the key components of this (and the last) administration's education policies are, in fact, grounded in the real world of education. For example, one of the key components of the "Race to the Top" competition was the reconstitution of "failing schools." In particular, it was believed that if 50 percent of the faculty was replaced, along with the principal (this was done at Miami Central), then the school would no longer be failing, and all could rest easy knowing that we had saved the students from being failed by the school. Obama said that at Miami Central "performance has skyrocketed by more than 60 percent in math." Anyone paying attention to how so-called reformers in education use percentage increases instead of actual scores to highlight their successes might have gone to Florida's Department of Education data sets to examine the actual numbers. The 60 percent increase in performance? Exciting, but the school ranks 430th out of 469 Florida schools in achievement in math, and only 56 percent of its students meet the standards in math, compared to the state's median of 77 percent. That gives pause. The President noted that the graduation rate increased from 36 percent to 63 percent, but the school ranks 431st in this category, with a state median of an 87 percent graduation rate. To be fair, we might look at the school's ranking in the "at-risk graduation rate" category, since so many of their students are in this category. Miami Central High School is 405th in that category. After hearing about the robotics and new science classrooms, we might have expected exciting science scores. Alas, in 2010, Miami Central ranked 448th in the percent of students passing science standards, with only 20 percent passing, compared to the state median of 41 percent. Finally, in measuring an area which most of us would agree is especially important – reading – only 16 percent of the students tested at Miami Central are meeting state standards. It is hard to understand how this "reconstitution" should be a model for reform, with fewer than one out of six students passing reading standards, and only one of five passing science standards. The improvement in math scores is laudable, but overall the math doesn't compute when we look across the school at areas such as reading and science that are clearly important in the high-tech future the President alluded to in his speech. The use of anecdotal data to promote a certain ideological version of "school reform" is only effective when the media are too lazy to dig behind a "press release" version of the news. In fact, it reminds me of the hype over a Chicago charter school highlighted for achieving 100 percent acceptance of its graduates in colleges. In spite of news outlets across the country reporting that this all-male, all African-American charter high school had beaten the odds (I in no way minimize the importance of the students being accepted into college), not one noted that only 17.2 percent of the students had passed the Reading and Mathematics portion of the Prairie State Achievement Examination, a key high school test in Illinois. Out of 1139 schools in the state taking this exam, Urban Prep Charter High School ranked 1067. Asking the all important questions of how well students do in areas not highlighted by the advocates, and in comparison to other similarly situated students, could have the effect of placing the claims of so-called school reformers in a more meaningful context which would allow the public to more effectively evaluate schools, and school reformers! Is it too much to ask the media to do their homework? Noel Hammatt has taught in middle school, high school, and college and served for 16 years as an elected School Board member in East Baton Rouge Parish. Thanks David! I have enjoyed your work, and the piece you referenced above is a great one! Now... if we can just get the ed writers out there to dig... or in some cases... if we could get their editors to allow them the time and effort to research some of the data! I want to be careful... I know of some writers who get shot down every time they want to question the editorial stance of their newspaper. Thanks again! Sigh, there are indeed lies, damned lies and statistics. This is especially so in the efforts to make education declared 'unfit for duty' and turned over to for-profit interests. Please, keep up the good fight--we're all in this together. Kids are worth it.